The first thing on blog-readers mind, if my mailbox is any indication, is the Bald Eagle from Post Lake. I am delighted to report that she is alive and by some miracle is doing much better. She is eating a little on her own now. That is a good sign. We are still feeding her liquid food via tube as well. She is still receiving the CA EDTA to chelate the lead from her blood as well as antibiotics and an anti fungal drug to prevent aspergillosis from taking advantage of her vulnerable condition, BUT SHE IS ALIVE. It has been a very busy time here at REGI. Par for the course that just as the interns leave, our clinic is filled with more patients. I do mean filled as in hardly able to walk around. We need a bigger place without question. 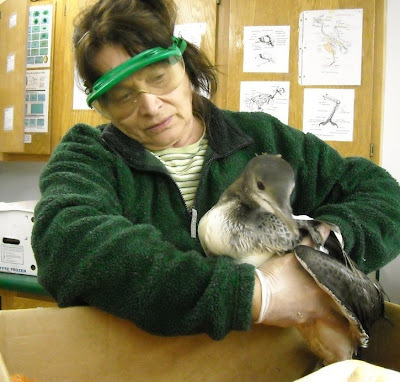 Judy Marshall, one of our terrific volunteer transporters, brought three birds in a single trip yesterday. That trip is over 2 hours one way so we are very appreciative of the Marshalls' help. 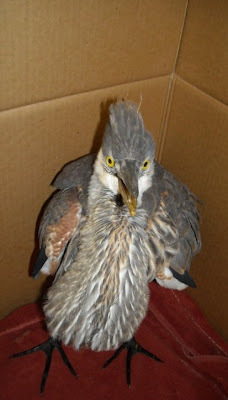 One bird was a young Great-blue Heron. It looks like it was clipped by a car just enough to give him road rash on his leg and foot. He is thin as well. Great-blue Herons' have a comical look about them. They put everyone in a good mood, if only because of their intense yellow eyes and crazy hairdo. Judy also brought along two Chimney Swift youngsters. They were likely abandoned by their parents during this seriously cold weather snap. Swifts eat only insects. When cold temperatures arrive insects die off. With no food to keep them alive, the parents do not have an option but to leave for a warmer climate. In this case they were forced to leave their nearly fledged youngsters behind in the chimney of a resident of the Marshfield area. 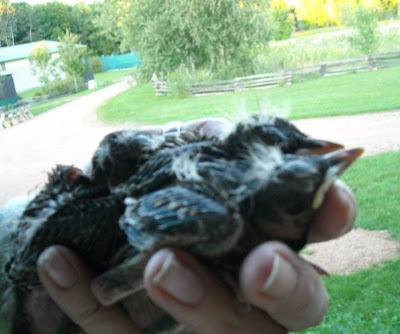 When the swift babes grew hungry and weak, they let go of the inside of the chimney where they were hatched, and dropped to the fireplace below. It is there they were found. The swift chicks are nearly big enough for release. They are thin however, so we are pouring on the insects to get their weight up to a normal level. Then they will be released in hopes of catching up to mom and dad. They have a long flight ahead of them. Swifts migrate as far as South America this winter. It is hard to imagine those tiny birds in our hands will soon make such a remarkable journey. 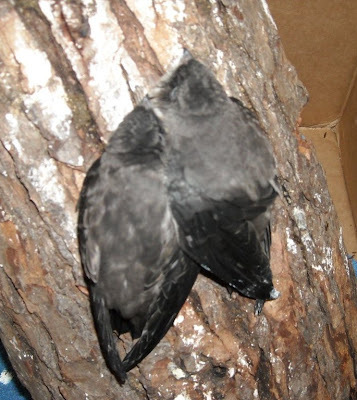 Swifts are some of the most difficult patients that come into rehabilitation. They have to be hand-fed every bit of food they take in. They eat while flying so have no skill level for learning to eat in any other way. 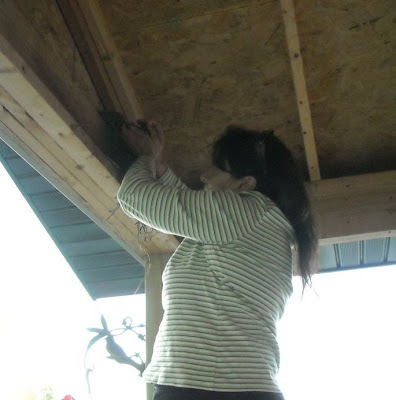 Our intervention of an American Robin nest is an example of another way wildlife rehabilitators help wildlife in need. The photos below will give you an idea of the story. We got a call last night as it was nearing dark. 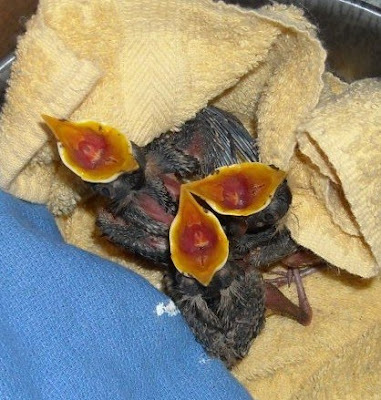 A homeowner was worried about a nest of young robins on her porch. They were not being fed. Earlier in the day they witnessed the adult female hit a window. She flew to a nearby tree afterwards, but she did not return to feed the little ones all day. 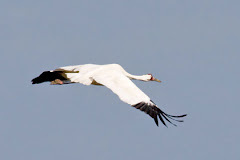 The adult was a single parent for this second batch of youngsters. The homeowner is familiar with the family of robins as they have come back to her yard each year for some time. She felt something must have happened to the male after the eggs were laid. We went to investigate. Our first thought was to feed the young in the nest. We hoped mom would be back soon to care for them. They were hungry and were letting everyone know with their screams. After I got up the ladder it became obvious that the babies were younger than we thought and were not old enough to thermoregulate or able to produce their own body heat The chicks were listless and weak. I made the choice to take them in for the night. They will be warm, fed and ready to go home to mom in the morning when she is feeling better. It is not true that birds will not take back their young if they are touched. So, in this case we hope for a happy ending. The adults are far more capable parents than we will ever be, so they are always our first choice if we can manage to reunite the adults with the chicks. 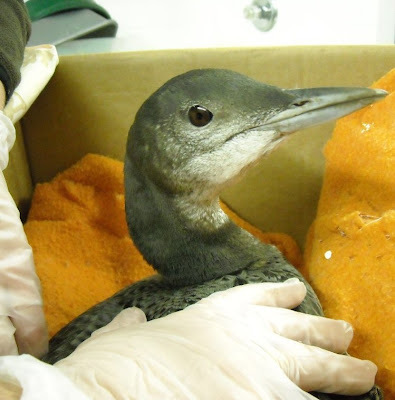 Late last night we received a call from a member of the public that was enjoying a vacation when the discovered one of the Common Loon chicks was in trouble. They called and I agreed to meet them about half way from the lake to our facility. We got back to REGI about midnight or a little after. Many times critical birds just cannot wait until morning and this is one of those cases. We do not have test results at this time, but is seems like an intestinal problem. It could be salmonella, botulism or even lead poisoning. All three conditions are known to be life threatening in loons in our region. Our thanks to the folks that cared enough to find him help even in the dark of the night. As you can tell it has been a very busy day. We are working hard, but getting it done. The birds are all so incredible. Even after all the years of working with them each is special and important. If is seems like we are here around the clock that is because we are. The downside of being a wildlife rehabilitator. 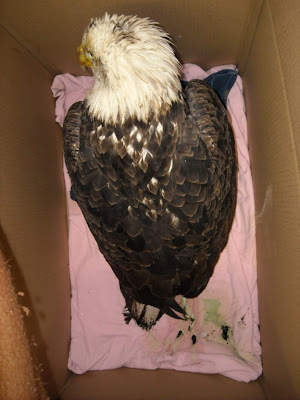 Lead Poisoned Bald Eagle Update! !